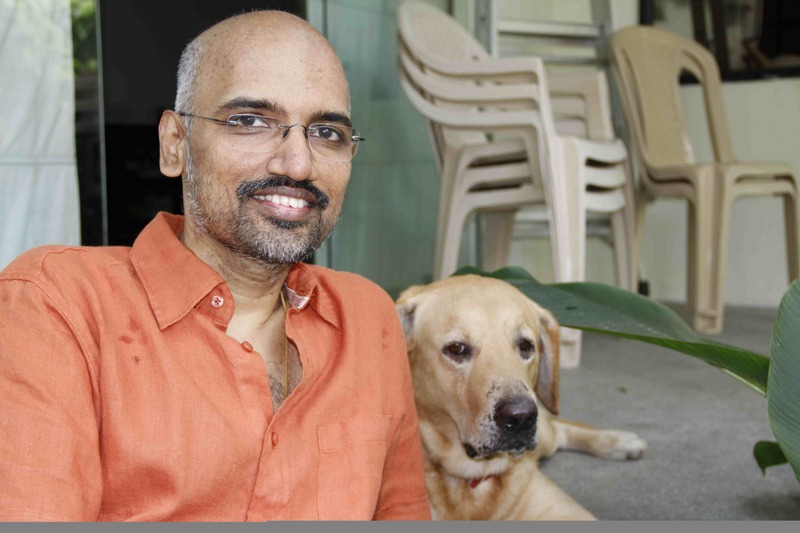 Interview: Sreekar Prasad – The FilmSmith [Uncut] | MADRAS INK. At the rate he has been walking up to collect a national award for Best Editing every few years, Sreekar Prasad probably has a photo album called Presidents of India with a caption: Same award, different President. For those who are still keeping count, eight now. From five different Presidents between 1988 (for Raakh) and 2010 (Special Jury award for his work in Kutty Srank, Kaminey and Pazhassi Raja). Not that he thinks about his date with the President at office every time he sits in a dark room playing God to another man’s fantasy. But surprisingly, for someone who makes all the big decisions, this editor is a simple, unassuming movie buff without even a wee bit of arrogance and a saint-like peacefulness and temperament. He just finished with different language versions of Santosh Sivan’s Urumi and Bhavna Talwar’s Happi and is currently halfway through Bijoy Nambiar’s Shaitan for Anurag Kashyap’s banner when he agrees to sit down for an interview at his studio in Virugambakkam. Q: With cinema changing, even dimensionally of late, how important is formal training for an Editor and how did you cope with all that’s been happening? A: To know the basics, it would be good to go to a school. Some people learn it practically. I never went to FTII. Since my family was in the studio business, I had the opportunity to actually watch what was happening. From there, I got interested in the process of storytelling. Basically, we are looking at storytelling with the material we have. That’s the limitation the editor has. He has access to a certain material, which may not be what the director promised to give him before the film… because there are so many variables in between the first draft and the final take. Through that footage, you’re trying to tell the director’s story. I also try to look at it slightly differently from the director to see if I can tell it more crisply without repeating myself and take a look at the performances. Because finally, editing is intertwined with getting the good performances, getting the right moments and making the story flow in a certain pattern, with a certain pacing depending on the story, the subject and sensibility. Q: How exactly does one learn on the job? A: I had done my graduation in Literature and that helped me get into stories, myth and mythology, the role of drama, the hero journey, etc. First, I worked with my father A. Sanjivi who was an editor and then with other editors and in different languages. Sometimes in a Hindi film, sometimes in a Malayalam film, sometimes in a Tamil film. So it kept me balanced because I am not tied to one approach or one sensibility or one culture. From the people I meeting, my experiences are changing. When I’m working with somebody from Assam, whose approach to filmmaking is different from here… they are making films for 25 lakhs where as here are we are making films for 25 crore. All these experiences make you aware of so many things. Q: So which film turned out to be the biggest lesson of your career? A: When I was apprenticing, I was working on a different kind of cinema – the regular Tamil and Telugu blockbuster variety. Then I got an offer to edit a film called Raakh made by youngsters (Aamir Khan’s early film directed by Aditya Bhattacharya). It was an eye-opener to me because I was not exposed to that kind of cinema till then. I learnt that cinema is not just about song and dance, it’s also able to bring out the inner turmoil of a character and how you can accentuate it with the visual tone. In most of the films around the country, there was no scope for actors to emote in between the lines. How much footage do I keep for the moment where the character is not speaking? It comes with instinct and you feeling for the character. I can keep eight seconds or 16 seconds of a close up and still make a point. That’s a judgment you need to take for which you need to understand the character. Q: Did working with Mani Ratnam change your style? Where does your role begin? A: I would just adapt to the director. I’ve been lucky that for most of my projects in the last ten years, I’ve been involved right from the script discussions. So all the feedback that I would probably give after shooting, in futility, I give in advance by reading the script. Once you have a good rapport, you get a sense of what will work or what will be an impediment as you read the script. Be it Mani Ratnam or Raam or Vishnuvardhan, I have always been kept in the loop from the script level. The major contribution that comes from the editor is how to tell the story in a way that it flows from A to B to C to D in a way that it does not deviate or distract from the story you are telling. One thing should lead to the other. Q: In the last two decades, we have had many experiments with non-linear structure. A: Conventionally, everything here is linear. If anyone wants to do something else, the counter argument is don’t do anything that will tax the audience. I don’t agree with that. But you need to keep in mind your target audience depending on what kind of cinema you are getting into. With the advent of more English films and TV, where we are exposed to lot of information at high speeds and the audience has started seeing a lot of things in between. The exposure has pushed a huge section of people at a more intelligent level, to read between the lines, to get non linear structure and it’s great that people have started experimenting. Q: How do you resolve Director-editor conflict? A: I have had less trouble than many people would have had. It’s a question of give and take. I truly believe that the director’s vision is what I’m trying to get on screen. So I don’t see any reason to supersede our arrangement of working together. And if both of them are looking at the betterment of the product, each to his capacity, we can always argue and evaluate both the options with the advent of technology. It’s become much more easier to put together different versions and compare. Q: Can you illustrate this with an example? A: The first film I worked with Mani Ratnam was Alai Payuthey. He had already planned for a non linear structure. Basically, at the heart of it, it was a love story. The difficulty for us at that time was to not let the narration overshadow the emotional content of the love story and still have a different sort of a narrative going. So then there was a lot of brainstorming to see how many times we can go back in time and come back to present… In the end, we tried to keep it as simple as possible. Q: So, the single most important quality for an editor is? A: Patience, to assimilate a lot of information. Over the years, I’ve developed a system where I do the first cut without the director so that I can get my own input into it. I need to watch all the takes, even the not good takes. Because certain set of actors who are new, they tend to be very good in the beginning and as the takes go on, you can see a drop in their energy levels. So what I do first, I go through all the takes, get all the best moments out of it and then play around with it. We also need to cover up certain things. You can’t expect all actors to be doing a great job, especially the junior actors. So I camouflage him by having the lines over the other person and still drive the scene around. There are always butterflies in your stomach the first time you are seeing the rushes because you want to do something, come up with a certain style of narration. It’s probably a good idea not to cut sometimes. Just because you have the luxury of having other angles, you tend to use it. But if it works undisturbed, you should keep it as it is. Q: You mean the best cut sometimes is not to cut. A: Yes. You should always ask why should I cut? The editor’s job is not just to cut and paste. If I cut, I should make a point there. The cut should move it forward. It’s sad that people associate editing with cutting a maximum number of times. Because someone has done it on a music video. But you have to know how it will play out on a big screen. Three minutes with 100 cuts on a TV maybe watchable but on the big screen, it could just be tiring with so much information. You need breathers, you need the ups and the downs. There will be situations where you need to pack in a lot of information, when you want to pack in intrigue but this trend of cutting so much has to do with people not used to working with a bigger screen. We are used to working on Steenbeck and then watching reel by reel. On an AVID, when you watch on a small screen, the judgement is different. A wide shot of 2-3 seconds may satisfy on a small screen but may not be enough for the big screen. Q: Every other person’s role in a film except yours is limited to the call sheet. George Lucas said: “A movie is never finished only abandoned”. How do you decide when you’re done? How much work do you put into it on an average? A: Depends on the scale of the film, it takes me four to six weeks for a smaller film and it would be spread over five to six months for a bigger film that has lots of shoot and reshoots. There is no end to it. What I believe is that the first time you start doing something, you develop a gut feeling about it. That’s when I am most objective about it. After a certain point, like everyone else associated with the film, I could lose objectivity. But wherever we can afford the time, we leave a gap of two weeks so that we chisel it more and look at it with fresh pair of eyes. The deadline of the release is what we work with. Never have I ever felt it is perfect. It’s an ongoing process. It just comes together at some point. Q: What have been the most challenging films of your career? A: Vanaprastham. It had so many philosophical layers and a kathakkali backdrop. Kathakkali is a programme that goes on and on, so where do you cut it? So it had to be shot like that. The performance was probably ten minutes but when it is all put together, the kathakkali takes predominance over the actual narrative. So we had to make it concise and make it a part of the story. Then comes the question of whether we are intruding into the creative sphere of kathakali because there would be criticism on how it is wrong to interrupt a performance. So we had to have one or two experts on kathakali to see if we can cut it appropriately for film and then we interwove it with the story. Another film we did a lot of work was Firaaq. It was a multiple narrative story and after it was shot, we realised it wasn’t getting a climactic moment to end. So then we had to rearrange the second portion of the film and shift a connecting incident to the end. It worked for us because the way it was written there was nothing happening in the end. The other challenging was to keep five stories running parallel and not get bogged down by one story. hello sir , am also ur big fan.